In what is likely the most detailed analysis of the impact of programmatic media-buying to date, a unit of Interpublic this morning released estimates indicating it is expanding at about double the rate it estimated at the beginning of this year, and now represents more than half (53%) of all online display ad buys in the U.S. advertising marketplace. Programmatic buys -- media purchased automatically through online advertising exchanges -- are now projected to reach $7.4 billion this year vs. the $3.4 billion that Magna Global, a unit of Interpublic's Mediabrands, had previously estimated for 2013. That means programmatic buys now represent about half of all online display advertising purchased in the U.S., and are growing faster than anyone had previously projected. 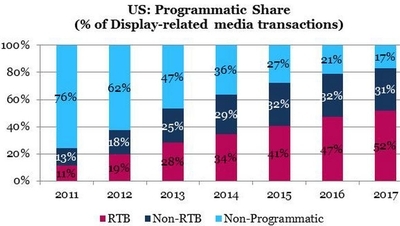 “We forecast robust growth as more publishers, advertisers and agencies embrace programmatic technologies,” reads the agency's report, which also estimates that auction-based RTB, or real-time bidding, buys account for slightly more than half -- $3.9 billion -- of the programmatic total, indicating that exchange-based technology is beginning to facilitate more “direct” buys between publishers and advertisers and agencies. “Of that total, RTB will represent $3.9 billion and non-RTB (NRTB) platforms will represent $3.5 billion,” the Magna report estimates, projecting that the volume of all forms of programmatic trading will continue to expand dramatically -- rising to $17 billion by 2017, representing 83% of all digital media buys that year. While Interpublic’s Magna unit is generally seen as one of the most authoritative sources for the U.S. and world advertising economies, including the shares that go to various media, Interpublic has a stake in the shift to programmatic, as the agency holding company retools much of its media services around advanced data and automation with a goal of making more than half of all its media buys automated within the next several years. Based on Magna's most recent analysis, that's certainly beginning to accelerate beyond online display advertising. While the agency unit projects that programmatic now accounts for 72% of U.S. desktop display ad buys ($5.3 billion this year), it is also beginning to impact other high-growth digital formats, including video, mobile and social. Magna estimates that programmatic now represents about 25% of online video and 68% of mobile ad buys. By 2017, it projects that programmatic buying will account for 87% of display, 69% of video and 88% of mobile advertising buys. The shift toward programmatic buying may have taken root in the U.S., but it is growing rapidly overseas as well. In its first analysis of the programmatic marketplace outside the U.S., the agency estimates that programmatic buying will “approach 60%” in some of the most technologically progressive Western European markets, including the U.K., France and the Netherlands. “Globally, over the nine key markets surveyed by Magna Global, programmatic buying already represents $12 billion in 2013 and will nearly triple in the next four years to $33 billion,” the agency concludes. 7 comments about "Programmatic Buying Surges, Now Accounts For More Than Half The Online Marketplace". Kevin Lee from Didit, October 14, 2013 at 8:55 a.m.
Wonder if they consider PPC search to be programmatic. Certainly for all of us who manage search through the API and make changes in close to real-time it is programmatic. Also, if this is indeed percentage of budget allocated to programmatic, then the percentage of impressions is likely well over 80% given the differences in guaranteed insertions order purchased premium inventory and programmatic (premium or otherwise). R.J. Lewis from e-Healthcare Solutions, LLC, October 14, 2013 at 10:11 a.m.
Joe, Kevin, or anybody else have a link to the report? Great summary, but I'd love to comb through the actual report as well. Thanks. Joe Mandese from MediaPost, October 14, 2013 at 10:21 a.m.
@Kevin: I don't believe Magna's analysis includes search CPC, just advertising impressions (display, video, mobile/social) bought programmatically. Kevin Lee from Didit, October 14, 2013 at 10:25 a.m.
Tyler Loechner from MediaPost, October 14, 2013 at 11:09 a.m.
@Kevin: Just confirmed with a Magna rep that the report doesn't include search. More to come on that in RTBlog today..
Jason Shugars from Martini Media, October 14, 2013 at 3:18 p.m. I'd love to know which platforms they're counting under the "NRTB" set. Especially as it's nearly double what the original estimate was. My assumption is it's platforms like REVV Connect, and other programmatic-but-fixed-auction models many of the agencies and publishers have been longing for. Kenny Stocker from Stocker Digital Consulting, October 14, 2013 at 8:27 p.m.
Wonder how much native inventory has taken away from traditional IAB ad dollars and in turn how much that has elevated the programmatic growth percentages?